During the deepest darkest parts of winter most people dream of a vacation somewhere warm and tropical. But me, I dream of clear cold days and dark long nights in one of the northernmost countries in the world. I’m not alone either. While Iceland’s high season still centers around its brief summer, more and more visitors are flocking to Iceland in the winter time, drawn by the better deals, lack of crowds, and I have to assume, the snow-covered scenery. So how cold is it? My trip in February was pretty chilly for this Pacific Northwestern wimp, yet completely bearable. Temperatures hovered slightly below freezing but it was not as cold as it was in New York City that same week. The sky was clear and sunny, though, and that made all the difference. Every once in a while a bracing wind would blow that woke you up and made you take notice. Cold is a terrific cure for jet lag. When I first visited in the summer of 2009, the country was reeling from the 2008 economic crash. Tourism was just starting to pick up but it wasn’t a major destination yet. In fact, I remember my coworkers being totally puzzled about why I would vacation in Iceland of all places. Now, Iceland is a bonafide destination, and tourism is clearly booming. Reykjavik is much less sleepy, buzzing with new hotels and restaurants. The economy is thriving in large part because of the influx of tourists and every local I met spoke glowingly about the jobs that have opened up because of the new visitors. This is smart growth, with a strong emphasis on sustainable tourism and the visitor experience. One nice thing about visiting a country that is so used to cold weather is that nothing really slows its residents down. Reykjavik is just as busy in the dead of winter as in summer. 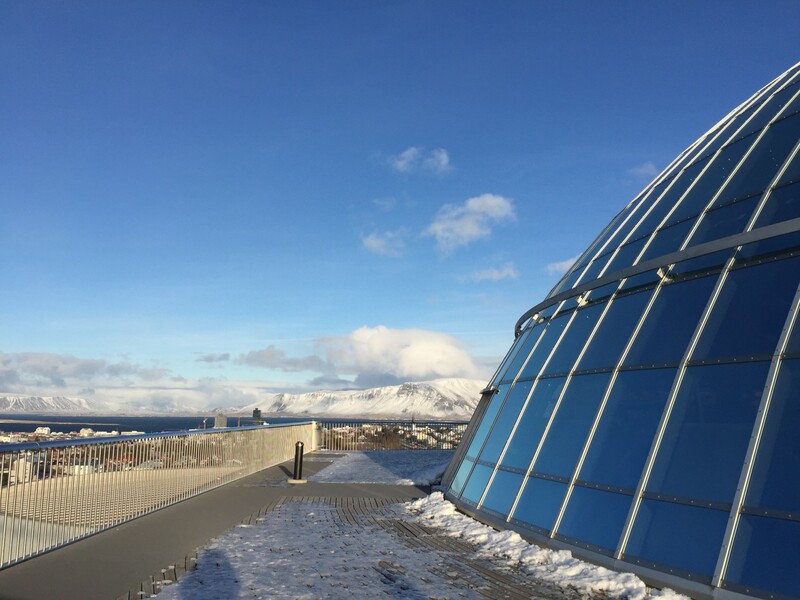 The restaurants are still hopping, the bars still buzzing and the newly completed performance arts center, the Harpa, twinkles in the perpetual twilight. You can see all the sights in Reykjavik in a single day, but the atmosphere can take a while to soak up. Wander the streets until your nose starts to get numb, then duck into one of the many coffee shops to warm up. Or take a walk down to the harbor and buy an ice cream cone from Valdísto to eat in the snow (it’s a testament to how good the ice cream is that you might actually want to consider this). Iceland is a surreal place to visit any time of year with its steaming fissures, dramatic waterfalls, lava fields and more. Even if you’ve visited before during a warmer season, winter offers a fresh take as the landscape is entirely different under a coat of snow. Even from downtown Reykjavik you can appreciate the snowcapped surrounding mountains, but it’s well worth it to get out of the city to experience the rugged beauty of Iceland in winter. Driving can be a bit treacherous for the uninitiated, but an organized tour or bus service is a terrific way to get out into the countryside. The famous Golden Circle attractions take on an entirely different vibe during the winter, particularly the geothermal fields, where hot water billows up dramatically from a snow-covered landscape. Iceland’s most famous waterfall, Gulfoss, is vibrant green and blue in the summer months, but transforms into an ice queen of raging water and snow in the winter. Wear good shoes; the paths can be treacherously icy. If you’re in the right place at the right time, you may catch a glimpse of the famous Northern Lights. I had no luck, but when the timing is right, electric green and purple phantoms dance across the sky. It’s not a guarantee, but you can up your chances by watching the weather forecast and heading away from the city for the clearest skies. No trip to Iceland is complete without a dip in one of the steamy hot springs that dot the countryside. Doing this while surrounded by snow and icy air feels especially opulent. 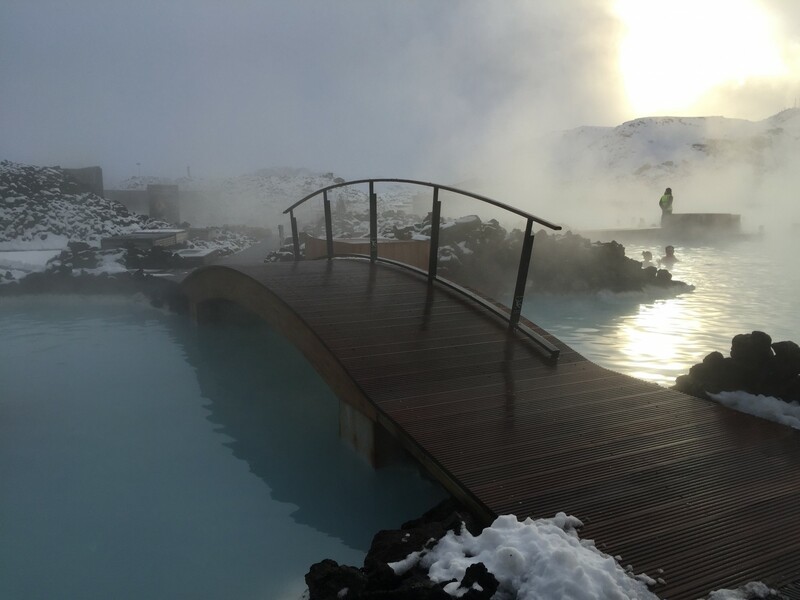 The most famous hot spring in Iceland is the Blue Lagoon, an unearthly blue geothermal hot spot where hundreds of visitors visit each day to relax in the warm water and rub themselves with the mineral-rich mud. The lagoon recently completed a renovation to make it even larger, and even at peak times there is plenty of room to soak and spread out. In the winter snow covers the surrounding lava fields and a thick cloud of steam hangs over the scene, making everything look otherworldly and ghostly. The Blue Lagoon also has a cafe, a spa with massages and other treatments and a world class restaurant (that books up insanely early). 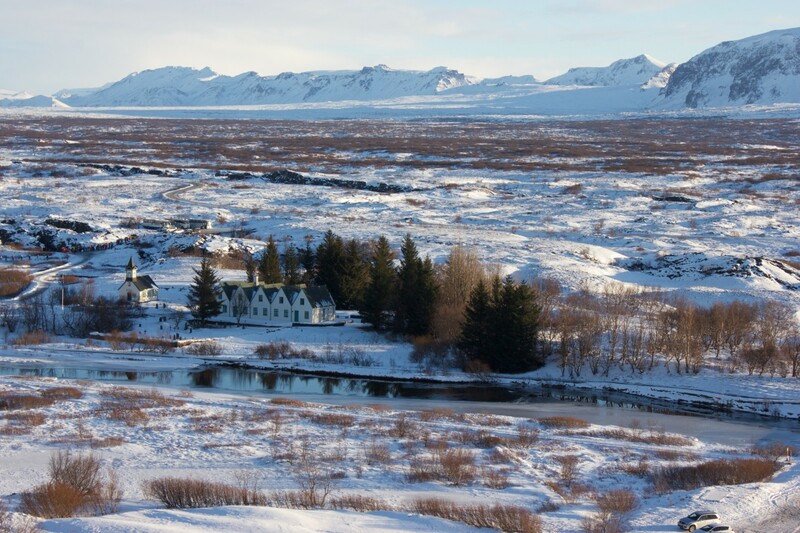 It’s an easy day trip from Reykjavik, or even from the Keflavik airport. Iceland wears its wintertime well, and a cold weather visit can be a magical experience for both deal seekers and thrill seekers. Visit Iceland and earn miles with Alaska Airlines Mileage Plan. Icelandair operates flights from 16 cities in North America to Iceland with connections to more than 20 destinations in Europe, including Amsterdam, Brussels, Copenhagen, Frankfurt, London and Paris. Travelers can also enjoy an Icelandair Stopover to visit the city of Reykjavik and tour surrounding areas for up to seven nights at no additional airfare charge. 3 comments on "The savage beauty of winter in Iceland"
“Cold is a terrific cure for jet lag” — hahahaha great. Do you get Northern Lights in Alaska? ‘was there in December on an IcelandAir / AlaskaAir trip to speak in England. What you say is true. I arrived in Reykjavik after two feet of snow. It’s the place that the adventurous dream of.